The HOBO Pendant Event records momentary contact events and temperature. Event data is only stored when it happens, which results in efficient memory usage while still providing detailed event data. Temperature data is recorded at a user-defined logging interval. 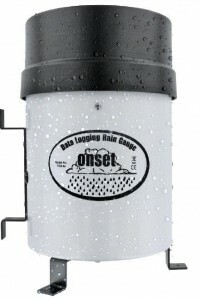 The HOBO Pendant Event is ideal for connecting to tipping-bucket rain gauges to record detailed rainfall data. Tips are logged with time-stamps to determine rainfall intensity. Accuracy: 0.47°C at 25°C; a solar radiation shield is required for accurate temperature measurements in sun. 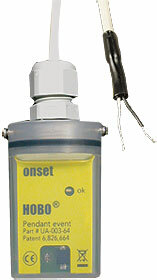 HOBOware Software and an Optic USB Base Station* with Coupler, are required to operate the HOBO Pendant loggers. The Optic USB Base Station includes an Optic Base Station and Pendant Coupler. The Optic USB Base Station offloads a full 64K logger in 30 seconds. The Base Station connects directly to a USB port on a computer, and the coupler connects the logger to the Base Station. The Optic Base Station is splash resistant. *The HOBO Waterproof Shuttle can also be used as a base station.